Did you know that car wrecks are the leading cause of death among children over age one? I take my own driving much more seriously now that I often have my small children in the backseat. It wasn’t long ago that I had only my own safety to worry about. I have become even more aware of safely driving my young children around over the past four years. Here are three helpful reminders for those of you who have young children or who are anticipating a new addition to the family. My first blunder as a new dad happened the day I picked up my wife and son from the hospital. As I was about to leave for the hospital, I proudly texted my wife a photo of the car seat I had installed. She called me laughing and explained that first of all, the car seat goes in the back seat, and second of all, it has to be turned around backwards. I’m proud to say I’ve become an expert at installing and moving seats around from the many times I have done it since then. Children should remain rear facing until they are at least two years old. Neither of my boys have had any issues with being rear facing. In fact, the photo above is my son just after his second birthday. You can see that he is comfortable and happy facing the back. Car seats even impact older children. 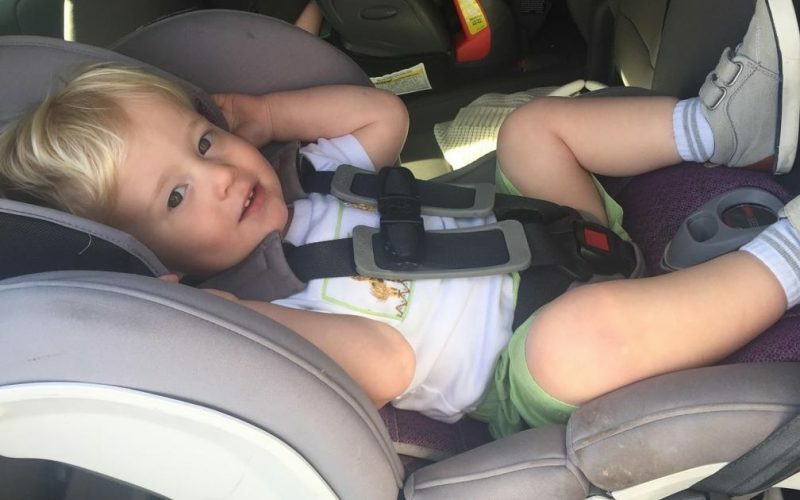 Children should be in a car seat with a harness until they’re at least four years old and in a booster seat until at least eight years old. Children under age 13 should not ride in the front seat. Things have certainly changed since my childhood, but we have the benefit of years of research and expertise to help keep our kids safer than ever. We hear a lot of talk these days about the dangers of distracted driving. One of the main sources of distraction leading to car accidents for many drivers is their use of cell phones. However, kids can be just as much of a distraction as incoming texts. They want us to look at the fire truck down the street. They want us to hand them the toy on the floor. They decide to have a temper tantrum during rush hour traffic. They are even occasionally screaming at each other, which can really wear on your nerves. I’ve found that having a small basket with a few books and small toys for each child is a life saver. If they can keep themselves busy, I am able to focus on the road more easily. My children have also gotten used to the words “no” or “not right now.” We talk about how I have to keep my eyes on the road and can’t turn around to grab something they have dropped at that moment. Finally, I’m always working on blocking out their noise. Sometimes kids just won’t be quiet. We have to tune that noise out in order to focus on the road. I rarely hear of cars backing up over kids in their driveways anymore. Perhaps back up cameras have had a significant role in curbing this horrific accident. However, I am aware of the ease of my children being hit by a car in a parking lot. I always remind my sons when we get out of the car of how short they are compared to the tall cars and trucks around us. It would be relatively easy for a driver to hit him simply because he doesn’t see him. My oldest son is a good rule follower and can walk right beside me as we cross the parking lot. My second son, on the other hand, is a little fireball and will take off if I don’t watch him closely. I make sure to hold his hand or even carry him across the parking lot. You know your children’s personalities. Set appropriate rules for the parking lot and stick with them consistently. What are your best tips for safely driving with children? These are some of the tips that have worked well for my family and me as we travel. Comment below with your own tips about navigating the road with your young children or grandchildren in tow. If you’ve experienced a car accident, call Hofler Law Firm. I hope these tips will help you prevent accidents. Many times, accidents are not our fault. If you have experienced a car wreck or another accident thanks to someone else’s negligence, give me a call today. I want to help you get the settlement you deserve. Jack is an experienced, local attorney with compassion for people who are suffering. Contact him for a free, no obligation consultation. Great post! I am glad that parents are being made aware of car seat safety. We hope to keep my daughter rear facing as long as possible. Is it true that it is now a law in SC for children to remain rear facing until age 2?? Yes, it has been the recommendation for a while, but now it is officially the law. Thanks for reading! It is good to know that you are keeping the adorable little boy in the post photo safe. Do you handle cases where children are injured in car wrecks? Even when they are in a car seat? Absolutely! We handle many kinds of car wreck cases, and we take injuries suffered by children very seriously.